Alpaca walking with Spring Farm Alpacas, East Sussex. 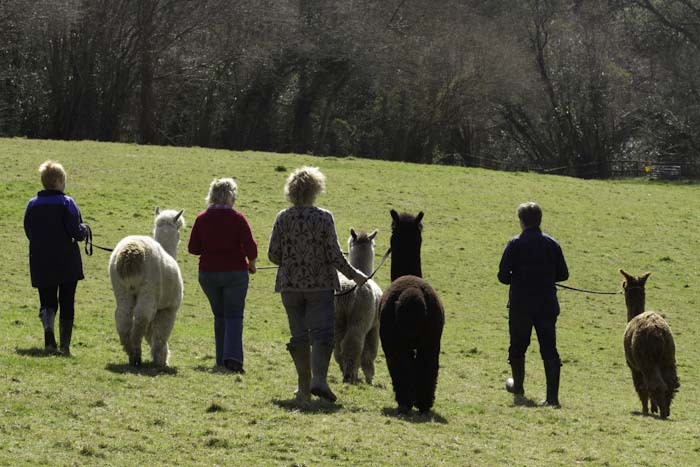 We offer alpaca walks around our beautiful farm in East Sussex. Situated in the High Weald Area of Outstanding Natural Beauty, Spring Farm is superbly located adjacent to the Ashdown Forest, Bluebell Railway, Sheffield Park and the historic village of Fletching. We are based in Sussex but easily reached from Kent, Surrey, Essex, Gatwick and London. From central London stations to Haywards Heath station is only 45 minutes by train and there is a taxi rank outside Haywards Heath station. The taxi ride is about 15 minutes – alpaca walking has never been so accessible! Alpacas are delightful and friendly animals and ours all know their names. Everybody who comes to our farm for an alpaca trek comments on how relaxing our alpacas are to be around. With their inquisitive nature, they are great fun to take for a walk and are certain to put a smile on your face! After a short introduction to us and our farm, we will introduce you to our alpaca family. We have about 125 alpacas (and 5 llamas) here at Spring Farm – at last count! We will then halter up our walking alpaca team and set off for a casual walk around our 110 acre farm. During the walk, we will tell you a little about alpacas, their history, their stunning fleece and how we go about farming here at Spring Farm. Spring Farm has been managed within Countryside Stewardship/Higher Level Stewardship for the last 19 years and we will tell you about farming in a wildlife friendly way and hopefully spot some of the wildlife we have encouraged to thrive here – a UK alpaca and wildlife safari! Virtually all the alpacas here at Spring Farm are halter trained. We could take out males or females but we normally select from a group of about 25 male alpacas for each walk (the “Team”). Before we introduce a new walking alpaca to the team, we will have spent weeks taking it on ever longer practice walks until we are happy that the alpaca will enjoy meeting people and accompanying them on walks. 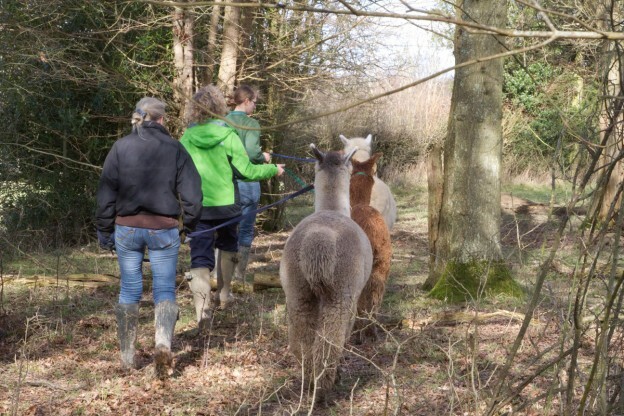 It is very important to us that our alpacas enjoy the walks as much as our guests. Given the walking team is 25 strong and we only ever walk a maximum of 10 alpacas, it gives us the flexibility to rotate our walking team so if you come back for a second walk (and we hope you will) the walking team is likely to include new faces to you! We expect the walking element to last about 50 minutes, and it is across undulating fields all within our boundaries – so you should not encounter any unexpected surprises. This is really important to us as you will not be traversing roads, public footpaths or bridleways. The route we take means you get wonderful views of the surrounding Sussex countryside, the South Downs and the High Weald AONB. The distance we cover is about a mile. We take photos of the walking group during the walk which we then send to you as a momento of your day with us (no charge). 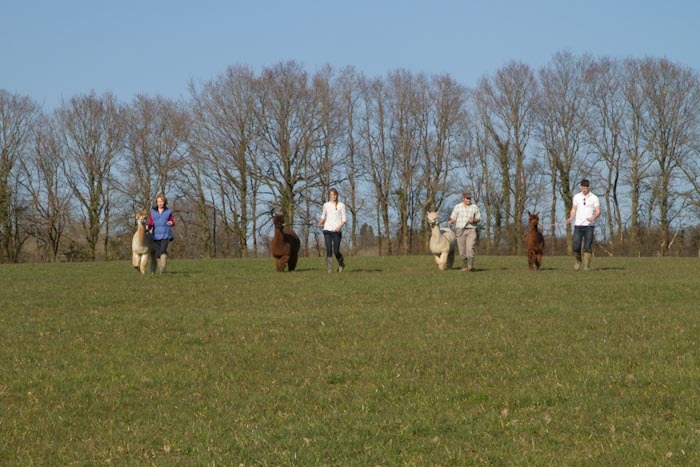 After the walk we need to reward our walking alpacas – its really important they enjoy the walk as much as you and it gives them a treat to look forward to. You pay your walking alpaca (or llama) in carrots (which are provided ready chopped by us!). This is another wonderful photo/selfie opportunity! We will then take you to meet our mums and babies alpaca group so you get to meet the whole team. Last year (2018) we have had 26 baby alpacas (cria) and one baby llama. If we haven’t exhausted you by then, we have a small shop selling only Spring Farm goodies – hand made gifts and 100% Spring Farm alpaca goods. A perfect momento of your time with our alpacas. Allowing for the brief introduction you should allow about two hours for the entire experience. All walks must be pre-booked and are available every day of the week and all year round (subject to availability but excluding Christmas Day and Boxing Day). Children must be over 12 years old to walk an alpaca on their own, although children aged 8 to 12 may accompany the walk providing that each child is accompanied by an adult. It is important at the time of booking that we know if any of those walking have any health limitations or health issues that we should be aware of. Where possible, we are very happy to modify the walk or distance in a way that accommodates any health concerns. Walking an alpaca allows you to walk YOUR VERY OWN ALPACA for the entirety of the walk. Accompanying a walker entitles you to walk alongside an alpaca walker but not to walk an alpaca yourself. We sometimes take a llama on the walk as well as the alpacas. If you would like to walk a llama please let us know. Alpacas are herd animals so a minimum of 2 alpacas must be booked for each walk. We normally cater for up to 10 walking alpacas on any given walk. 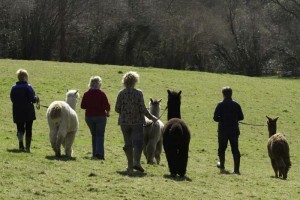 It is possible to accommodate single walkers but only in conjunction with another group so as to always have a minimum of 2 alpacas walking – as they are herd animals. Walks start from the farm yard at about midday. We ask that you arrive ten minutes beforehand so we can be good to go at midday. If you arrive earlier, we would suggest visiting Trading Boundaries at the end of our road for coffee/tea as we are working right up to 11:50am most days! We are not an “open farm” and can only offer alpaca walks by prior arrangement. Our farm is on clay so sensible footwear is a must (wellies in the Winter, walking boots or trainers in summer) and we strongly recommend long trousers. Clothing should be appropriate for the conditions but please avoid really bright colours or anything that might flap. We have stringent bio-security so we will ask you to dip your footwear on arrival. Our alpacas and llamas are not used to dogs so we have a strict no dog policy on the farm or walk. Alpacas are like us and won’t be happy to walk in bad weather. If we (or you) defer due to bad weather or unforeseen circumstances, we are happy to rebook at a mutually agreeable time thereafter. We can cater for educational visits, hen parties or special events – please contact us for details. Vouchers are available (and gift cards) – please contact us for details. We offer a fabulous one bedroom holiday let if you wanted to extend your stay or just chill out/ help out on a working alpaca farm – just bear in mind its for a minimum of a week! If you need to contact us directly or have any queries please get in touch.